In December 2015, the UN Security Council, under the leadership of Jordan, unanimously adopted UNSCR 2250, a ground-breaking resolution that recognises that “young people play an important and positive role in the maintenance and promotion of international peace and security.” The Resolution requested the UN Secretary-General to order a study on “youth’s positive contribution to peace processes and conflict resolution, in order to recommend effective responses at local, national, regional and international levels.” The resultant Progress Study was recently released following global consultations with more than 4,000 young people from 44 countries. Today, members of the Security Council will convene at the UN Headquarters in New York for an open debate in which the Progress Study will be officially presented and member states will have an opportunity to affirm their commitments to its recommendations before tomorrow’s high-level meeting on sustaining peace is under way. Without doubt, there is growing global momentum for and recognition of the vital role of youth as peace builders. In this blog post, Generations For Peace (GFP), as a leading organisation supporting youth-led peace building, unpacks the new Progress Study, giving you a birds-eye view of the report, highlighting its key findings, and sharing how they resonate deeply with what we at GFP do and who we are. Youth in Kyrgyzstan playing together, erasing often contentious ethnic lines one activity at a time. Of the world’s 7.6 billion people, 1.8 billion are youth. Yet, they are often overlooked in peace and security efforts despite the fact that they make almost a quarter of the world’s population and their work promises the potential of an immense peace and security dividend for governments and international actors. The Progress Study calls them the “missing peace” and adopted a participatory research process with youth views at the centre. Several thousand diverse young people, including refugee youth, former gang members, and youth living in hard-to-reach locations, were asked to share their views on youth, peace, and security. The Progress Study’s participatory approach resonates strongly with GFP’s own approach to monitoring, evaluation, research, and learning. In 2010, we established the Generations For Peace Institute (GFPI) to drive our learning and greater innovation, quality, impact and sustainability of our work. Since 2013, all of our programmes have adopted our Programming Framework, in which the volunteer youth leaders that we support carry out participatory processes to design, implement, monitor, and evaluate sustained peace-building programmes in their communities to address local issues of conflict and violence. This includes quantitative baseline and end-line surveys and participatory evaluations, the findings of which are compiled into reports and discussed widely in communities to inform future programming. Youth in Sri Lanka uniting across communities to build friendships and peace. Unlike many other identities such as race, gender, or ethnicity, youth is a transitionary period. The Progress Study notes that it is important to recognise the differences among youth, avoiding the assumption that there is sweeping unity among them and challenging the stereotypes that undermine their peace-building efforts. For instance, gendered stereotypes often portray young men as “violent predators” and “potential spoilers of peace,” and young women as “passive victims” or “invisible.” Assumptions around “youth bulges” and the supposed correlation between a large youth population and an increased risk of political violence can be used to justify repressive actions by States. “Policy panic” around youth and violent extremism, in which only a small fraction of the youth population is actually involved in violence, can limit youth’s participation in political processes. The Study suggests investing in the preventative “upside” by focusing on the positive contributions of the majority of youth to peace and security, rather than fixating on the negative contributions of the few. GFP’s programmes are specifically designed to both combat these assumptions and foster an environment that allows youth to address the actual problems facing a community rather than the assumed ones. We apply a gender- and age lens to not just our programmes, but also our assessments of them, creating inclusive terms of engagement between men and women, children and youth, varying ethnicities and religions, and more. Moreover, our programmes give youth opportunities to actually demonstrate their leadership through small local actions in their own communities, and to experience – often for the first time – that feeling of being trusted by adults and authority figures, and appreciated for their contribution to their community. This reflects our values of youth leadership, community engagement, active tolerance and responsible citizenship. 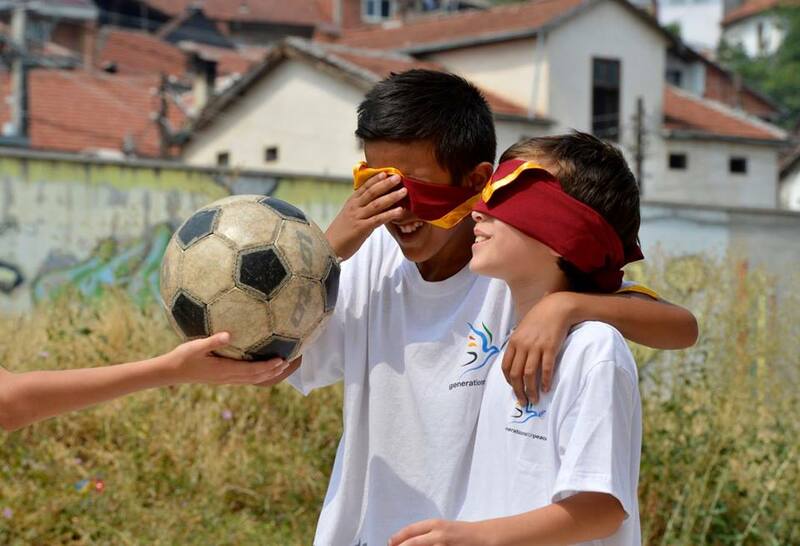 Two young boys in the Republic of Macedonia engage in Sport For Peace activities that teach them about disabilities and acceptance. Once the stereotypes and assumptions described above have been acknowledged, youth can be better equipped by governments and organisations to build peace and transform conflict. Youth around the world have unique and personal concepts of peace building, which are much more than the ending violence, but also engaging the structures and systems that give rise to corruption, inequality, and injustice. The Progress Study is full of examples of how youth do this in a variety of contexts, with the running theme that recognising and supporting the agency, ownership, and leadership of youth is effective in building peace. This is the very concept on which GFP is built. Most organisations in the field, like GFP, strive for two key things: empowering youth to develop their skills in understanding conflict resolution, and reducing violence and promoting a culture of peace in communities. Through our grassroots Sport, Arts, Advocacy, Dialogue, and Empowerment programmes around the world, GFP empowers youth to mobilise their peers and other community members to address local dynamics of conflict and violence that might be overlooked by other actors. A telling example of this is in Palestine, where youth have been addressing gender equality and violence in schools through their GFP programmes. Young peace-building volunteers share their experiences from their work in their communities at GFP Advanced Training. Exclusion is a form of structural and psychological violence: it breeds mistrust, it draws division, and it inspires conflict. Even the simple fact that youth are often excluded from the conversation that surrounds building peace signifies the widespread and fundamental challenges facing those trying to overcome exclusion. The Progress Study found that within youth as a group, there are a range of identities that often face exclusion: gender can determine who is included or excluded, as can ethnicity, religion, nationality, language, refugee status, etc. Youth often face exclusion from education, from communities or from activities based upon a variety of factors outside of their own control. So how do we respond? By providing opportunities to foster meaningful inclusion in all capacities. This is largely why GFP focuses on youth as the source of their volunteer leadership in the field: including youth is a vital step toward building peace, and involves recognising youth leadership, vision, and knowledge. We honour the work of our youth volunteers, celebrating them for their committed efforts, dedication, and success. We provide opportunities for sustained vertical and horizontal learning through our cascading model and advanced trainings that allow them to learn through one another’s experiences and from our experienced team of peace practitioners – many of whom started out as GFP youth volunteers – by creating an environment in which youth feel encouraged to share their stories and knowledge. Young girls in South Sudan participate in a 3×3 basketball tournament. Youth have a vital role to play in society at the local, national, regional, and international level. However, this requires an important distinction in the way we approach working with them: we cannot create an environment of control or repression, but rather one of value and respect. In order for their contributions to scale, we must view them as the indispensable allies that they have proven to be. Prioritise partnerships and collaborative action, where young people are viewed as equal and essential partners for peace. GFP is proud to contribute to all three strategies and support youth-led peace-building programmes around the world based on the principle that youth possess the knowledge, skills, and passion to transform conflicts in their communities. We invest in the capacities of young people, providing them with knowledge and resources to become leaders in their community, fostering unity, addressing conflicts and building peace. We call on other actors to do the same, turning UNSCR 2250 from words into action. GFP is a proud member of the UN Working Group on Youth and Peacebuilding, and participated directly in the Progress Study.